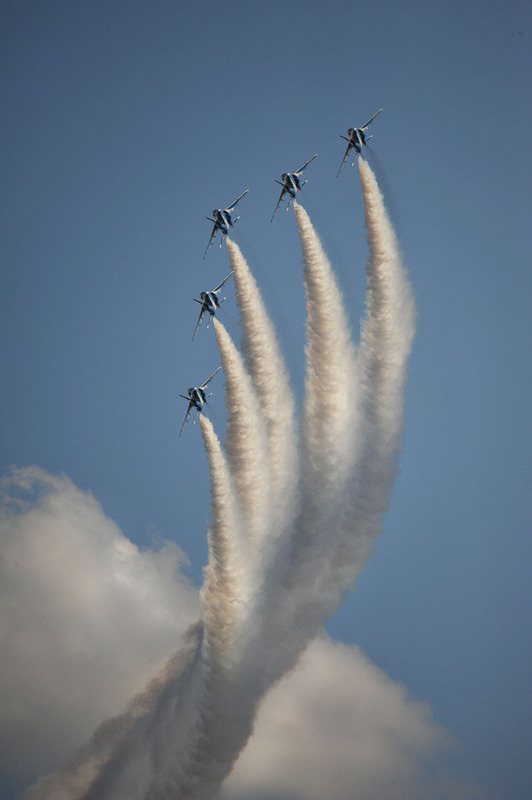 Some more shots of the wonderful Blue Impulse Air Show at Iruma Base up in Saitama prefecture, just north of Tokyo. 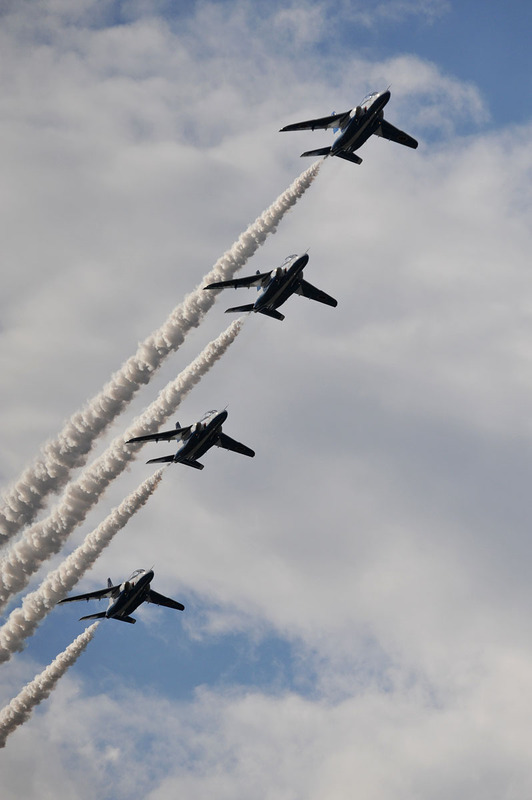 Shooting air shows is a tricky thing, it demands not only that you know the optimal mix of settings on your camera, but also that you know where and how fast the airplanes are going. Waiting until you see the perfect shot is not an option, and unless you have a really fast camera, just shooting mindlessly is even less of an option. 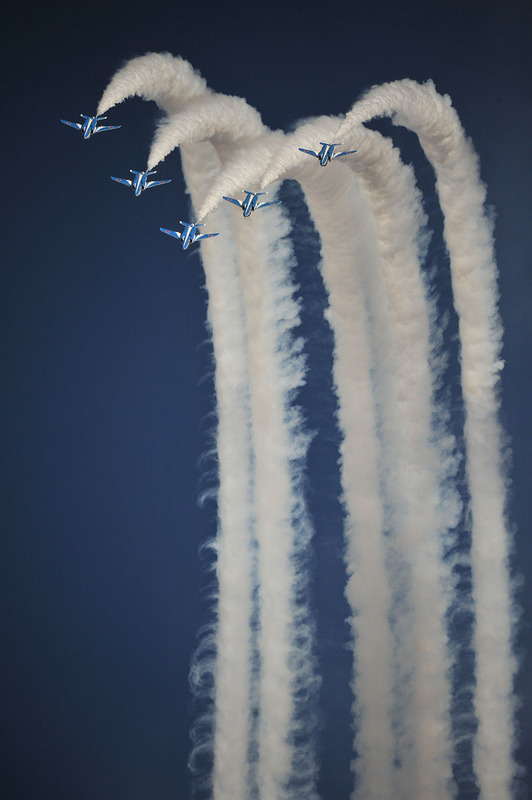 This was my second visit shooting this air show so I was lucky in that I knew what kind of formations they would be flying in an what kind of loops and angles they would be using. Of course, having the same kind of weather as the last time didn’t make things more difficult either! I used a 50-500mm tele-zoom Sigma lens, set a very high ISO and and a quite tight f-stop to get a broad DOF. Of course, I made sure I had shutter speeds way above 500 at all times, preferably at around 2000-3000th of a second is optimal for this. 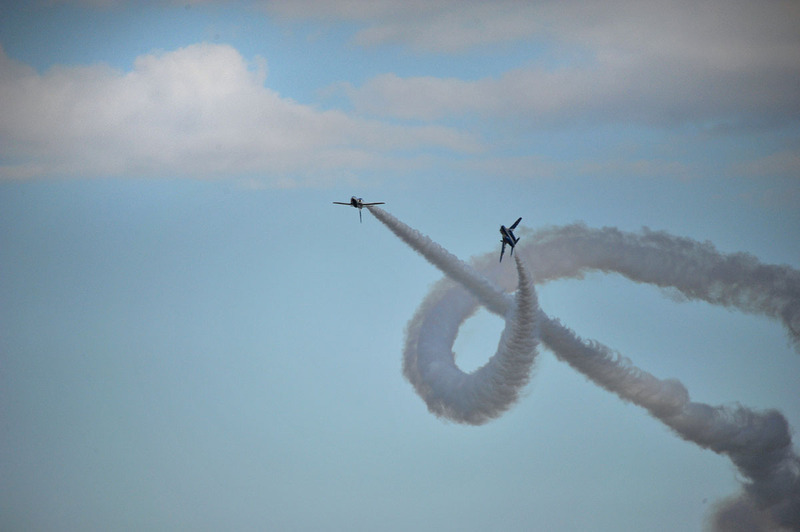 Sometimes you can track the formation, sometimes you compose the picture as you follow a moving air craft with a plume of smoke, and sometimes you just shoot like crazy to catch things that happen at 2 or 3 times the speed of sound, like when two air craft move towards each other. I still haven’t been able to get that exact instant. Anyway, I hope you will like these photos better than last year’s. I think they’ve improved a little. Enjoy! fantastic photos! 😀 especially like the fifth one. Wow, the photo #5 is superb. I’ve only watched a couple of airshows with fighter jet exhibitions. 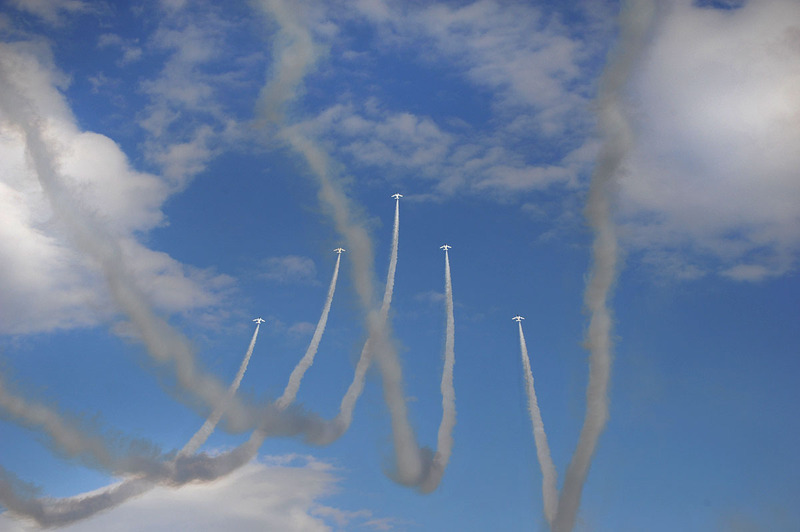 I once saw the Blue Angels from far enough away that the first part was entirely silent (and the sound continued long after the show was over). Another time I was too close for the fly-bys. The jets were outracing their engine noise, so if I turned toward the sound I would only manage to catch them out of the corner of my eye. When they were high overhead, it was much easier to follow. Thanks! As in all things, moderation seems to be best! 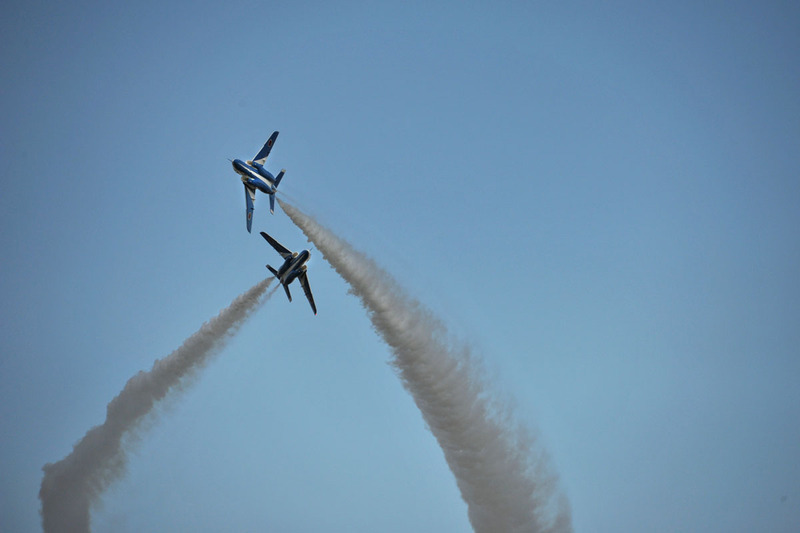 Not too close, not too far… (^-^;) I have never seen the Blue Angels in action, maybe some day! Ah, to be able to fly like a bird…! Thanks for the kind comment Timi! looks like you were flying with them! Great shots!! I really like the 2nd one. Very nice!! Thanks John! Glad you liked them! Nice photos! I especially like number 3 and 5. 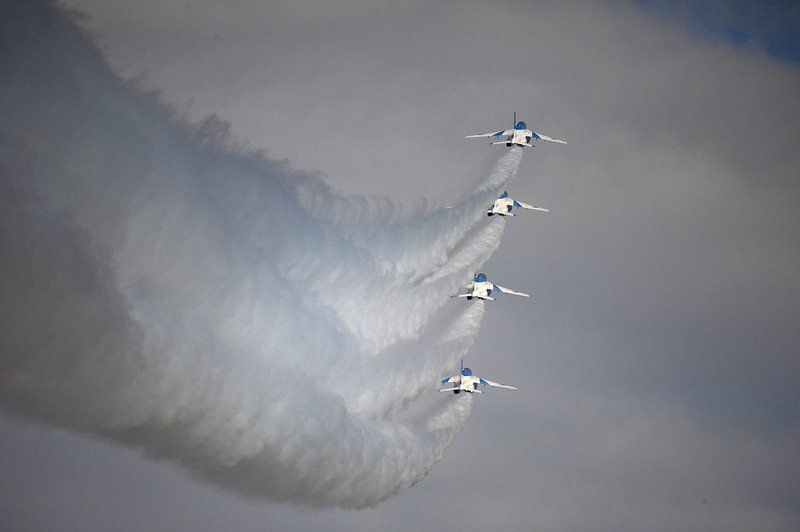 I’ve been to the Iruma to see the Blue Impulse a couple of times, but we stayed near the train station. I would like to get closer this year, but I’ve been scared off by the huge crowds. Is it that crowded on base? What time do you recommend getting there for a good spot to see the show from (near?) the runway? Hi Danny! It is really crowded on base as well, but since the base is huge and the train station is tiny it gets better once you get inside. There’s basically only one solution, and that is to show up earlier than the crowds and also maybe to avoid going by the closest station. 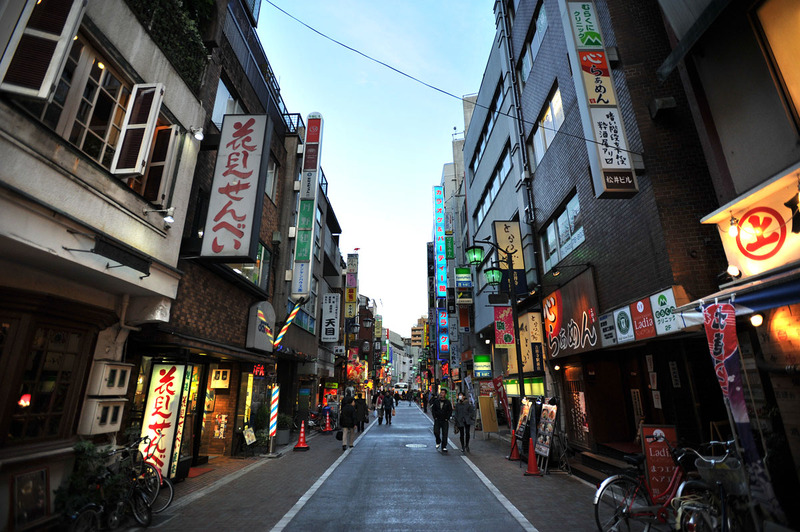 I prefer to walk from Iruma station, that way you miss the worst of the crowds! But it is usually quicker to enter than you think. Good luck next year!